What happened in the former Soviet area after 1991. Russia and its ‘internal backyard’. The collapse of the Soviet Union was one of the most important events in the twentieth century. It represented the final conclusion of the Third World War, the Cold War, and the end of the ideological struggles that marked the past century. It has also become a source of inspiration for the still oppressed peoples in search of freedom in other continents. The Russian Federation and the former Soviet republics are no longer together a Superpower as they were for decades. After a complex transition Moscow has acquired new weight on the international stage and Russia is today a well respected regional power in Europe and Asia. The post-Soviet area, on the contrary, is the battlefield for the control of vast energy wealth. Its pipelines run towards Europe, China and in the near future to India through Afghanistan. 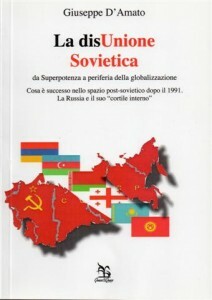 The author of the book observes the main dynamics in this crucial area for the West after 1991, while famous specialists such as the former Italian ambassador Sergio Romano, the American professor Richard Pipes and the Russian specialist Andrei Rjabov provide basic interpretation keys. A better life in the Soviet epoch? The Silk Road or the Drug Road? Modern khanates: “I have a family”! E-mail: info@grecoegrecoeditori.it tel. +39-02-58312811. +39-02-58312811. Cost volume EUR 12.00 + postage. OR visit Greco&Greco site.